Native American silver rings have been part of the Southwestern culture for centuries. The first known silversmith was a Navajo named Atsidi Sani. His work has been dated back to about 1860. Over the next few decades Sani taught many students how to create Native American silver rings, belt buckles, bracelets. The Native American silver rings and jewelry became a trade item valued by many who traveled through the developing country. By 1872, the Zuni tribe began to incorporate silver into their jewelry making and designed original Native American silver rings and jewels of their own. Since they were already well versed in the use of other fine metals, silver was a natural addition for them. As silversmith artistry grew in popularity, the techniques began to include turquoise and other precious stones in most jewelry and other designs. Early pieces were just surface stamped or punched décor on simple plain silver bands. The cross and crescent shapes became recognized as symbols of power among the native populace. Native American silver rings were often created with these symbols styled into the setting. Similarly styled bracelets, concha belts, pins and hair pieces were often traded with other tribes and Mexican silversmiths. The silver coins received in trade were then melted down to be used in additional Native American silver rings and adornments. By the 1900’s, the commercial trade for Native American silver rings, bracelets and necklaces grew extensively. It was considered fashionable to own Native American silver rings and jewelry at this time. The appeal of Native American silver rings, bracelets and necklaces comes from their symbolic joining of life. 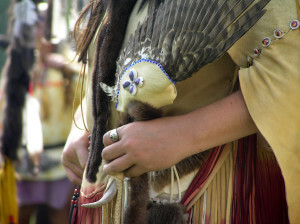 Feathers are considered a symbol of honor, bear paws symbolize inner strength while the bear represents leadership and the buffalo is representative of a Great Spirit protector. These handmade creations carry many of these symbols stamped into their bands. Many of today’s Native American silver rings combine the symbolization with specific stones. As Native American silver rings are designed, it is not uncommon to find that the stone used matches the symbolic representation of the chosen insignia on the design. A great example of such a pairing is the tiger’s eye found on a Native American silver ring with the shape of an eagle. The stone represents courage and protection while the eagle represents bravery. Both are strong representations that provide comfort and peace to the wearer. Today’s culture values the symbols of strength and honor represented on many Native American silver rings and various jewelry styles. Native American silver rings and jewelry celebrate the inner peace of the soul. Copyright © Native American Rings 2017. All Rights Reserved.